The F Zone is contiguous and to the West of 36E area of the O’Brien gold project. Results obtained from the 2016-2017 drilling programs allowed to define the vertical and lateral extension of historical mined stopes on the F Zone (See 20.2 g/t Au over 2.5 m and 11.9 g/t Au over 3 m). Following 3D modelling of former mining infrastructures on the F Zone and 5,408 metres of drilling, this area will be integrated in a future resource estimate update for the O’Brien gold project. Drill hole OB-18-86W1 intersected 6.13 g/t gold (“Au”) over 4.70 metres (“m”)at 420 m vertical depth. Drill hole OB-18-87W1 intersected 8.83 g/t Au over 1.50 m at 220 m vertical depth. Current campaign was completed with the main objectives of reducing drill spacing and defining western extension of the F Zone. “We’re excited by these high-grade gold intercepts obtained west of the current resource area. Results from these drill holes completed prior to the structural reinterpretation continue to demonstrate the exploration potential of the O’Brien gold project. Considering the high-grade gold results obtained on the F Zone since 2016, this area represents an excellent growth opportunity in a future resource estimate update at O’Brien”, commented Mario Bouchard, President and CEO. 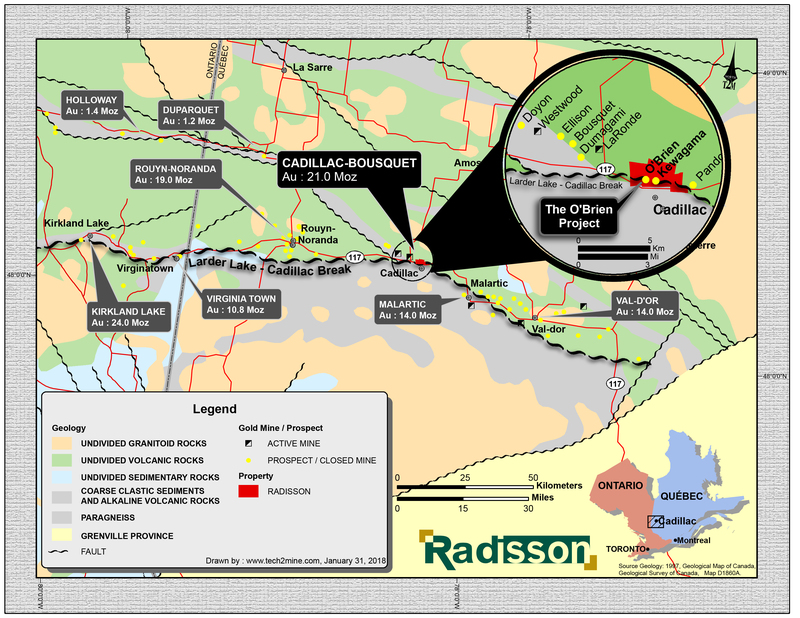 Radisson is a Quebec-based gold exploration company focused on its 100% owned O’Brien project, located Abitibi, PQ in the Bousquet-Cadillac mining camp along the world-renowned Larder-Lake-Cadillac Break. The Bousquet-Cadillac mining camp has produced over 21,000,000 ounces of gold over the last 100 years. The project hosts the former O’Brien Mine, considered to have been the Abitibi Greenstone Belt’s highest-grade gold producer during its production (1,197,147 metric tons at 15.25 g/t Au for 587,121 ounces of gold from 1926 to 1957; InnovExplo, May 2018).